Germany provides a real-world example of how the United States can unleash the vastly underserved wholesale distributed generation (WDG) market. 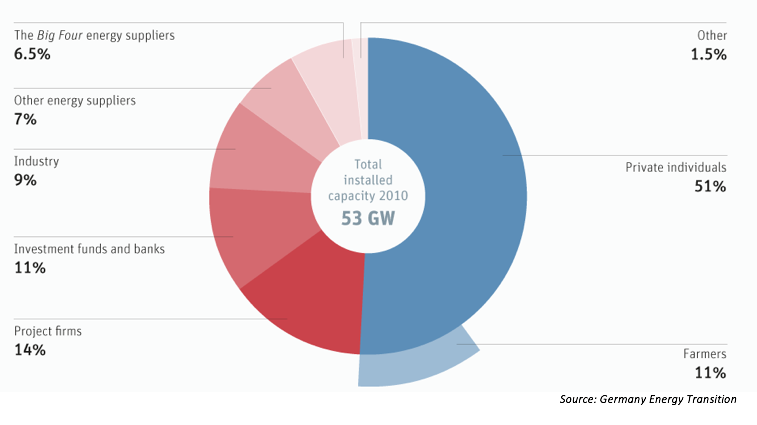 Using FITs, Germany has removed obstacles and uncertainties from renewable energy’s path. FITs can easily reduce costs by 20% by preempting bureaucracy alone. Predictable, streamlined procurement and interconnection radically reduced the costs to build local renewable energy projects in Germany. 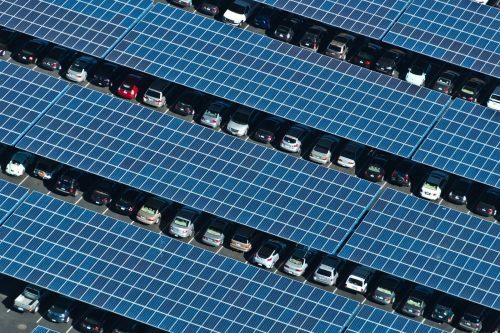 Replicating Germany’s scale and efficiency in California would result in rooftop solar costing between 4-6 cents/kilowatt-hour (kWh), due to California’s better solar resource and applicable tax treatments. No source of energy we’re procuring is in that low price range when you consider the costs of transmission delivery; FIT projects do not use the transmission grid, which alone has a price of 3 cents per kWh in California. In addition, a significant percentage of Germany’s renewable energy installed under the country’s FIT is in the hands of the people. The world owes Germany a debt of gratitude for instituting its fit. 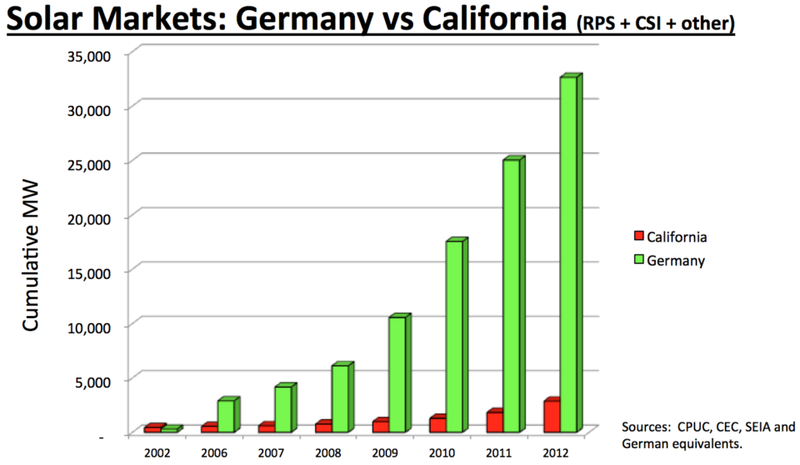 The German FIT achieved economies of scale, bringing down the price of solar. 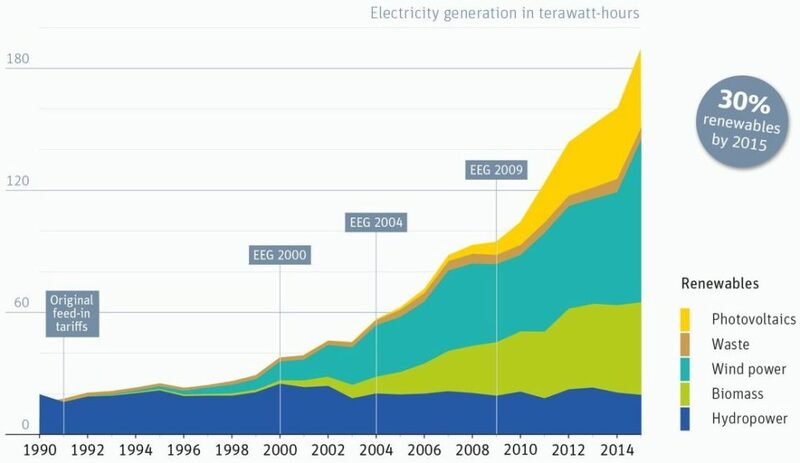 In large part because of its FIT, solar prices have plummeted since the German FIT was enacted in 2000. The only approach that has been proven to unleash wholesale distributed generation (WDG) in the United States.